Whether it is placed in a hallway, entryway, living room or office, this Bombe Chest is sure to bring refinement into your room with its classy, traditional nature. Six drawers and two cabinet doors provide ample space for storage of papers and other valuable items. It is the design and rich, reddish brown finish however that make the biggest statement. 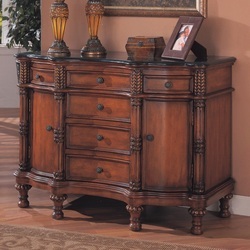 The chest features highly ornate columns, carved turn feet, and antique finished hardware. Giving it an extra sense of sophistication is a black marble top. With so much prestige and embellishment, it is no question that this Bombe Chest will become a focal point in your home.